Tough, versatile, and easy to maintain. Volta's unique product provides solutions for your unique applications. As the only Volta provider in the United States to sell through distribution, Apache keeps you mission critical to your customers. The homogeneous no-ply construction of Volta belting eliminates the need to have edge capping and its non-absorbent material makes the belts bacteria-resistant and impenetrable by most chemicals. These advantages create a belt that performs well in a variety of food processing and general conveying environments. Volta belting options from Apache include food, positive drive, general conveying, V and Round (VAR), and Haul-off solutions. The food and beverage industry’s needs are broad and its requirements are stringent. For such challenging needs, Apache recommends the Volta homogeneous product line. These belts perform well in a variety of food processing environments. Cheese, poultry, meat, fish, seafood, fruits and vegetables, chocolates, snacks, potatoes, nuts, and bakery facilities are all great places for recommending this product. Volta belting is available in blue or cream, is FDA/USDA approved, and also 3A Dairy certified. Volta positive drive belts are manufactured with materials resistant to cuts and abrasion, thus eliminating places where bacteria can harbor and grow. This makes for easy and efficient cleaning, meaning you save on labor costs and production downtime. From soft belts with high grip, to hard surfaces that resist cutting, punctures and abrasion Volta’s general conveying belts offer the same unique homogenous characteristics as the food grade belting. 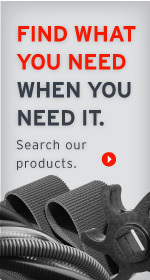 This product line offers a wide range of belts designed to meet some of the most demanding requirements and challenging applications in the field. Apache offers a wide range of Volta extruded profiles in both V and Round cross sections. This thermoplastic belting option comes in a variety of colors and durometers. They also include the ability to be reinforced, or to come with a molded grip top cover. Haul-off belts, also known as puller belts, are pulley driven belts that run parellel to each other and exert pressure to product sitting between the belts. These belts work in pairs to grip and haul product through the machine, and can be custom made with covers specifically suited to the product being hauled/conveyed. Volta's haul-off belts can handle material for printing, labeling, and packaging, and are ideal for rolling shaped profiles like tubes and rods. They can be produced with either a flat or poly-v base, depending on customer requirements.